When I enter a rung comment in UniLogic I can only see a line and a half, not several lines like the old Visilogic? Is there a way to expand this display to multiple lines? Hi Joe, As I'm not really into Unilogic, I only have 1.18.60 on my system for occasional playing around. It appears to handle comments fine. See attachments. It will automatically roll into another line and open a scroll bar if necessary. I was simply playing galloping horses on the keyboard. Same thing but with the ladder area widened. Wondering if it might be another hiccouph in the new release? Incidentally, and probably another topic, I was intrigued that I couldn't open my simple test program if I clanged the Unitronics.Notifier.exe after program open but before opening the ulpr. What exactly does this part of Unilogic do? Hmmm?!! That is the Region Comment. No. I tried pinky-click all over the place and I get your result. Sorry about the wrong comment selection. I can open a scroll command box, I can open the font format etc, but I can't make the comment space any bigger either, and I spent 10 minutes hunting around playing "find the hidden control". It looks like a bug to me, as the thing on the RHS looks like the top of a scroll bar that I assume is meant to be showing completely when you choose to see a comment. Perhaps the creators think that hovering is the best way to see the full comment...that works, but is a bit impractical. 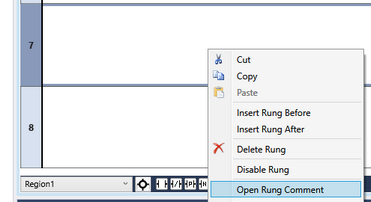 The rung comment height was 3 or 4 lines in the past, but it was requested by other users to reduce it's size. Currently, dynamic size per comment is not possible. @Saragani - thank you for the explanation and the history. We appreciate it. Different people put different emphasis on program documentation - I obviously want more room or I wouldn't have started a post.